One of my most important considerations when developing recipes in the Upper Zambezi Valley is the weather. For nine months of the year it’s hot, with October being the hottest month of all. It’s the hottest and the driest. Suicide month, as some people call it. Here, right now, we long to smell THAT smell, petrichor. We long for our first drenching of rain. We long to wake up to a cool, wet dawn. This is no place to dally. Garden manager, Peter Komanyana (right), and his assistant, Richwell Nduba. There is a great deal of food here, as it turns out, because we grow and nurture our own organic vegetable garden. And it’s at its best in October, when the heat ramps up and before the heavy rains set in, bringing with them insects and disease. It’s in my garden in which I dream up dishes I know will counter this heat. It’s the garden that always teases my imagination. It’s where I go first. It’s where I go last. It’s my beginning, it’s my end. Mixed leaves and flowers in the raised beds, all of which ended up in my green gazpacho. I introduced tomatillos in my garden this year, and they are thriving! And that’s the thing. Most people think gazpacho is made with tomatoes, when tomatoes were an addition only after Christopher Columbus discovered the New World. To start with, the aforesaid Roman ingredients were mixed with water, before the Spanish had the idea of adding raw vegetables to enhance the soup’s flavor. A viola pokes its head out among the Swiss Chard. The original green gazpacho recipe I used was Yotam Ottolenghi’s. I have since modified it to suit what grows well here, leaving out ingredients that I think overpower the flavor. I then had the idea of creating a small salad in the center of the soup to showcase all the ingredients I used to make it. 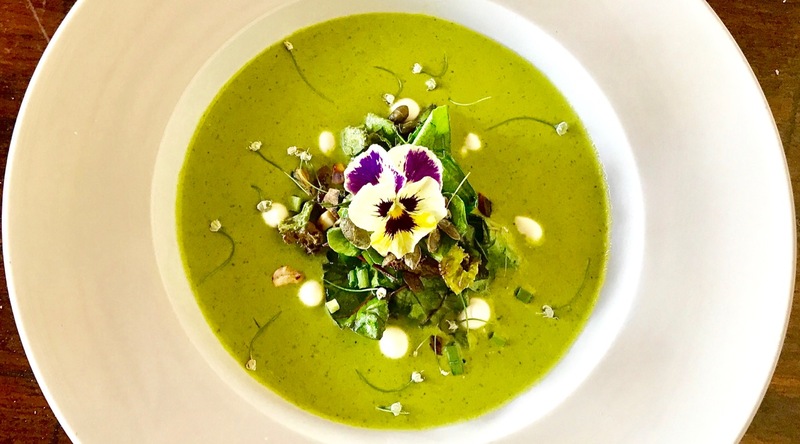 I served my Green Gazpacho Salad with Roasted Pumpkin Seeds & Mongongo Nuts for the first time last week at The Elephant Café to a group of guests visiting, funnily enough, from Spain, Italy and France. They loved it. The Green Gazpacho Salad with Roasted Pumpkin Seeds & Mongongo Nuts is super-healthy, filling, and flavorful. It can be made in large batches and frozen, if you leave out the yoghurt and then add it later. It’s also a terrific way of avoiding waste in your garden. An onion flower which I used as a garnish. Lots and lots of leaves to choose from for a gazpacho. Notes: try and use young leaves if you want to avoid a bitter taste in the soup. Remember, there is a lot of preparation of fresh ingredients in the making of this soup that can be done in advance. Give yourself time. Roughly chop up the celery, cucumbers, bread, chilli, tomatillos and garlic. Place in a blender and add the sugar, nuts, mixed greens, lettuce, basil, parsley, vinegar, oil, half the yoghurt, most of the water, the ice cubes, the salt and some pepper. Blitz the soup until smooth. Add more water, if needed, to get your preferred consistency. Taste the soup, season with salt and pepper, and adjust accordingly. Set aside and chill until ready to use. Carefully combine the salad ingredients, setting aside a small amount of pumpkin seeds and mongongo nuts for garnishing. Cover and set aside until ready to use. Make the salad dressing by combining all the ingredients in a jar, sealing, and shaking well. Lightly dress the salad ingredients and set everything aside until ready to use. To plate: use one ladle of chilled soup per plate. With tongs or your hands, carefully build a small salad in the center of the soup. Garnish with dots of Greek yoghurt around the salad, as well as a sprinkling of mongongo nuts, roasted pumpkin seeds and spring onions. Top with edible flowers, and serve with warm ciabatta bread. Green Gazpacho Salad with Roasted Pumpkin Seeds & Mongongo Nuts.